We had a lovely experience at this out of the way gem! It is laid back and quiet. Nedda and Gionatan were great hosts and we wished we could have stayed longer. We did a lot of driving on many winding roads to get around, but the area is beautiful and you cannot take a photo to capture it - you have to experience it in person!! Mille grazie!! Il posto ideale per qualche giorno di relax nel mezzo della campagna a due passi dalla valle del diavolo coccolato dai super accoglienti padroni di casa. stimmungsvoll, wie vom Anbieter beschrieben gute Lage - schöner Garten. 14 Tage in einem geschmackvollen, authentischen und stilvoll restauriertem Haus .Den Fernblick und die separierte Situation der Wohnung bzw. Terrasse, wie auch den wunderschön angelegten Garten haben wir sehr geschätzt. Wir haben uns wohlgefühlt und sind immer wieder gerne von unseren Ausflügen zurückgekommen. Überaus nette Vermieter - von unserer Seite aus sehr zu empfehlen. The pictures of the Pergola were exactly what we wanted for our stay in Tuscany. When we arrived we were completely and utterly in love with place. In the weeks before our arrival the owners had already provided very accurate directions as the farmhouse is nestled on top of a hill at end of its own charming access road. In addition to this the owners were available to answer any questions we had and also provided information on the local area. We arrived after dark and so it was only the next morning that we were treated to the truly wonderful view across the valley from our private terrace - where we would spend many a happy hour relaxing, reading, eating, drinking and taking in this fabulous view. The style and the decor was totally right for the property with the solid, authentic period peices combining with the beams and the tiles to create exactly the right atmosphere for a rural Tuscan retreat. The kitchen and bathroom were very well appointed and clean. 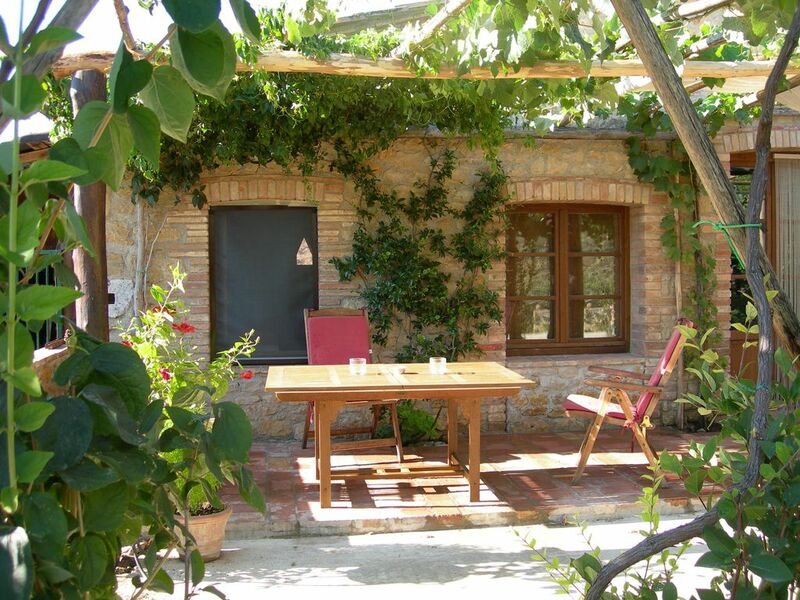 The owners live in the main part of the farmhouse which was reassuring and they are friendly and available but respected our privacy throughout our holiday. There are many utterly charming towns and stunning views to discover in the local area and we would recommend visiting a vineyard and also horse riding. Here is a fantastic base from which to discover this beautiful part of Tuscany and a beautiful place to relax in......surrounded by beautiful Tuscany. We spent 3 nights at Pergola but would have liked to stay much longer. The farmhouse sits on a hillside and the views on 3 sides are beautiful. Sitting on the patio for early morning coffee and at sundown was a wonderful experience. The apartment has everything needed for any length of stay. The kitchen is fully equipped and the bathroom is exquisite. The apartment was spacious, comfortable and had a great deal of old world charm. The gardens surrounding the farmhouse, with grape vines, olive and pomegranate trees, roses etc., add beauty and interest to the building. Our hostess, friendly and welcoming, left a beautiful bouquet of pink dahlias as she knew we were celebrating our anniversary. The nearby villages of San Dalmazio and Montecastelli Pisano are well worth a visit. All in all, our stay here was thoroughly enjoyable. Wir haben eine wunderschöne Woche in dem Bauernhaus verlebt. Die Lage des Hauses, die ursprüngliche Einrichtung des Hauses waren optimal. Alle Sehenswertigkeiten waren gut zu erreichen. Nedda und Co. waren sehr freundlich. Wir haben nichts auszusetzen! Wir können das Haus allen empfehlen, die eine gemütliche Fewo haben wollen, Natur geniesen und Sehenswürdigkeiten in der Nähe haben wollen.